I'm Thankful for "Shop Local"! Shopping season is upon us, but don't go hit the malls! Those tired predictable gifts are feeding a boring economy. Support Handmade! I used the "Shop Local" feature on Etsy to bring up pages of people making awesome stuff in my own backyard. Here's some of my favorite picks in the colors of the season. Be sure you check out what's being made in your backyard! 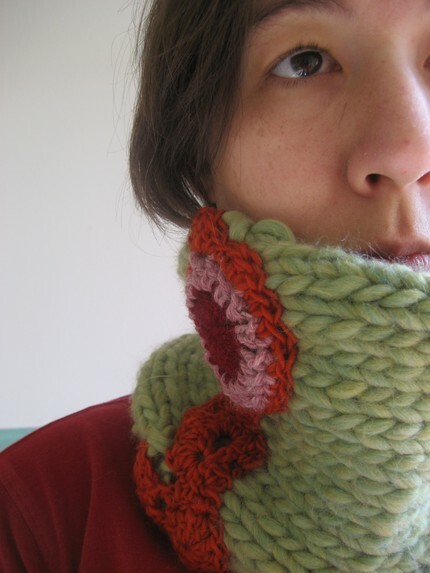 Check out this sweet yarn creation from BeckyPotter! A warm fuzzy for these cold Colorado winters. An exciting design and nice colors you could wearthis in many ways and with many ensambles - casual to formal. Not to mention, nothing is more stylish than handmade! 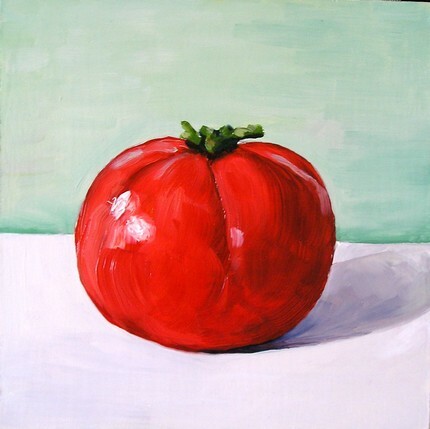 How about some original Art for the food lover in your life? Bonus, it's technically christmas colors, but no one will notice that if you hang it year round! Sharonschock has a number of cute little original paintings just waiting to find a wall of their own. Art is classy, fun and will last a lifetime, a perfect gift! 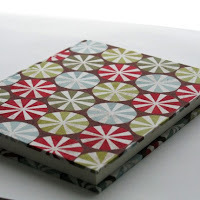 Here's something to write down all those holiday memories in! 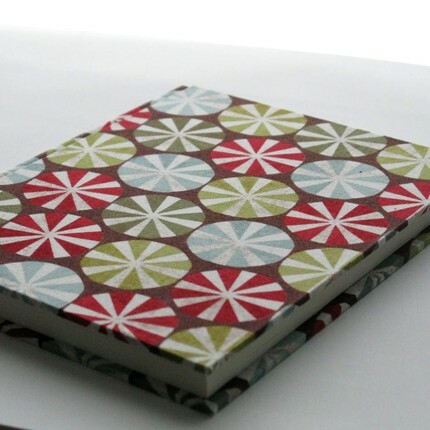 Derrick from Disconsolator makes high quality beautiful hand bound books, in many colorful fabrics and styles. He'll even do custom work for you - how great is that? How about something Eco-friendly? 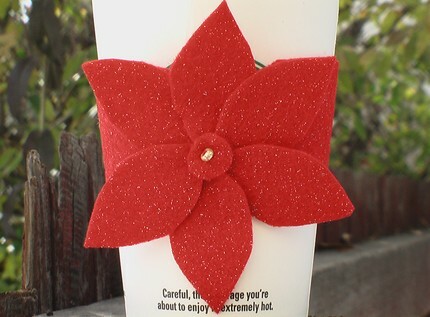 (I can hardly get through a blog post without one) Kimwhitecreations made this lovely sparkly cup cozy so you can say no to the cardboard sleeve in style. Extra points if you bring your own cup. Warm beverages and cute stuff... What a great way to celebrate the season! I'm getting ready for the Holiday Handmade show sponsored by Fancy Tiger! It's the first Friday and Saturday in December. Plan to be there to see all the fabulous goods from Denver's Indie Crafters. 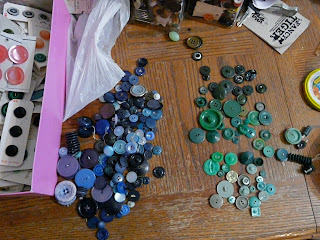 I'll be working hard this week to bring up my inventory. Mom is my hero. Once again hit the estate sale jackpot. 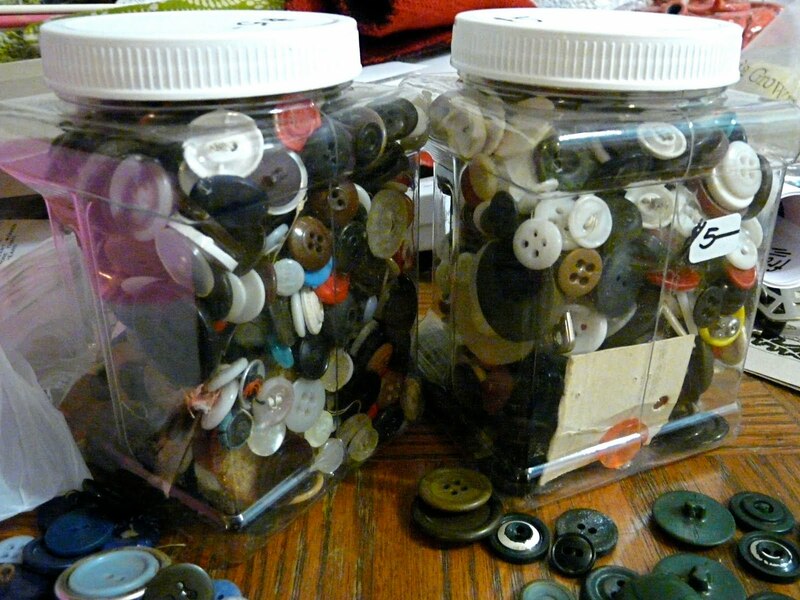 4 jars of buttons and a shoebox of 'em still on the cards. Woot! Now I can be destracted from actually sewing by the rainbow pile of buttons waiting to be sorted and paired up... Some of those on cards will be for sale in my etsy shop soon - I like to spread the joy around! Today I took the bus to my parents to pick up some yarn for a delivery order, a good excuse to get some knitting in too! While knitting on the bus some people came and sat down across the aisle, and we began to chat. It was a Father and Daughter from Libya, the father was here to study at DU. He began to ask me (at his daughter's bequest) about the names for what I was doing and where the supplies could be bought. It seems his daughter crocheted at home and wanted to continue here. I learned that crochet is the same in Arabic (as well as most romance languages) and yarn is "lana" (which is wool in Spanish). Since the moors brought the skill to Europe they got to make up the words! People all over the world engage in handicrafts, so this woman so far from home saw me knitting just like her mother had done and we found common ground in talking about yarn. It feels good to know that these universal skills can be away to understand people from very different cultures. (And considering I always look for the LYS when I travel, I'd say we're not really all that different!) Crafting really is a universal language. Here's what I have so far, long enough that I have to fold it over for the picture but still short of a nice scarf length. 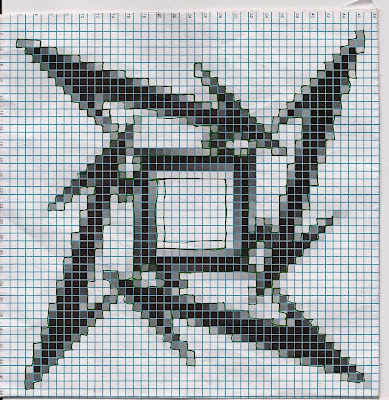 I will do another repeat of the logo and cap it with a third ninja star. 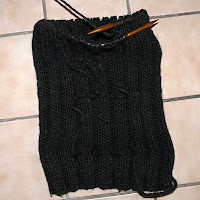 I promise I will not continue to knit until I've used up all 16 oz. of each color... douple knitting takes soooo long! As winter begins to settle in we are bringing in the last of summer's harvest and packing things away for the winter. This is my favorite time of year to cook up lots of yummies for now and to preserve the food for later. Thanksgiving can't come soon enough! Naturally we start with Dessert first. Doesn't everyone? 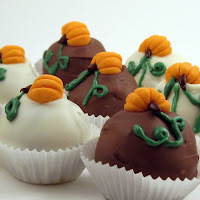 Look at these fabulous little treats, cute and seasonal. And Lollidreams description makes my mouth water. You deserve a little treat every now and again, so make it a really good treat! And for serving up the goods? 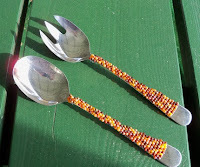 Colorful beaded utensils like these from BrightSpotDesign are useful and *sparkly* which is always good. No worries about having matching flat wear, these will go with anything. What about serving up those luscious foods? Pass this lovely bowl, heaped high with your favorite seasonal creation. 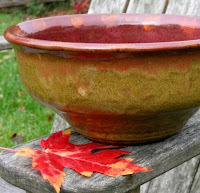 DancingDolphinPotter has created this wonderful handthrown bowl for fall. The stonewear is perfect for durability and to hold warmth, home made food deserves home made containers! The goodness of fall is all around, and these great handmade goods just make it better. Be sure to support these and other crafters this Autumn. 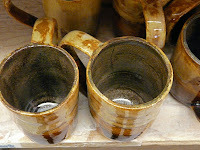 Nine cups in shades of brown, all ready to be filled with steaming hot coffee! The kiln goddess blessed me with some lovely shades and the perfect amount of creep for this special commission. I'm starting to feel like my kitchen needs more hand made goods, I'm jealous of the lovely woman who will soon have these gracing her cabinets If you too wish to own some lovely vessels custom designed and unique... just drop me a line! What did I do for my 24th? 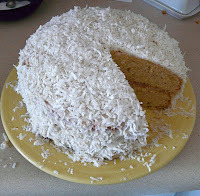 Made a fabulous cake with coconut icing! I then went out and danced the night away at the Mercury Cafe... just like I do every Sunday night. Who could ask for more?